It’s been a few months since I’ve posted, but my 5th Edition D&D campaign is still going strong. I am having a great time with system, particularly with the flexibility and ease of running things on the table. If I want a quick, narrative only encounter, I can do that, but when I want a map and minis and all that, the system supports it seamlessly. I’m very happy with 5th Edition in general and with our monthly campaign in particular. I wanted to share a cool idea I had, sort of at the last minute, before our last session. For context, a bit about the adventure: the party was exploring the depths of a dangerous yuan-ti temple. As they got deeper in the temple, all manner of puzzles, encounters, and traps impeded their way. I had one room I wanted to put something cool in, just before the archetypical big bad fight at the end of the dungeon. Unfortunately, I had pretty much run out of inspiration and there were only 20 minutes before the players were to arrive. I started thinking about props, which I love to use as often as I can in my games. Did I have anything readily available that might work? Maybe some strange artifact that asked a riddle? Too late to find a good one. Maybe I could print out a maze puzzle or something? That would probably take them out of the immersion. I stood in my game closet, looking around, and something caught my eye. When the group finally arrived at the magically barred door to the final room, a puzzle awaited them. I described a stone pedestal topped with an inscribed turquoise surface, perfectly round in shape. The edges of this beautifully crafted circle were inlaid with garnets. Strange symbols, forged delicately of gold, were evenly placed around the frame.In the center of the strange table was a lever, also made of gold. When the rogue stepped up to pull the lever, after checking it for traps, the gold symbols raised up from the surface. At the same time, depressions in the turquoise surface appeared. These depressions shared the same shape as the golden symbols. The lever began to inch slowly back into place with an ominous ticking noise. At this point, I dropped the classic dexterity game Perfection onto the table, and twisted the dial to the start position. The players all loved it, particularly the young lady playing the rogue. She managed to deftly place the golden symbols into the proper depressions before time ran out. 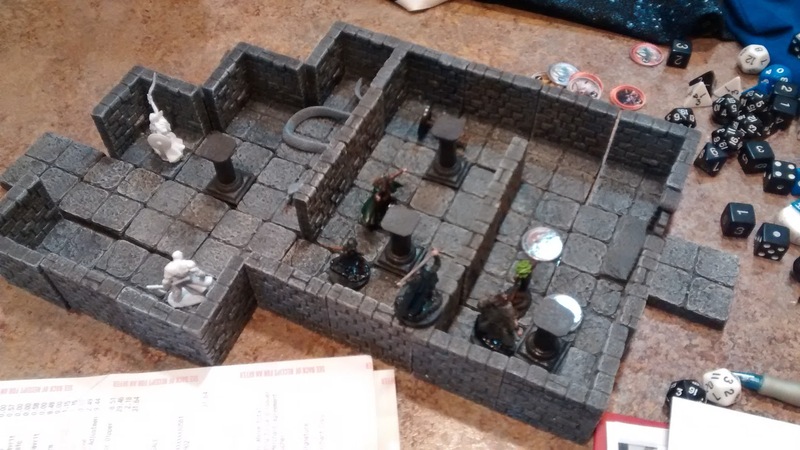 When she did, the arcane locks disappeared and the players walked through to the final fight. The last room was large, with a smaller inner chamber. The walls to this chamber were protected by a shimmering, multicolored barrier. I wanted the group spread out for the big battle, so I described four statues, each in the corners of the room. A gemstone was set in each statue, and from the gem, beams of energy burst out, powering the barrier to the chamber. Each stone was a different color, represented on the map by a glass bead. The PCs needed to destroy (via damage) or disable (Arcana check) the gemstones to proceed. Pretty cool, right? It looked good on the table and I was proud of it. Then one of the players said “Sweet! 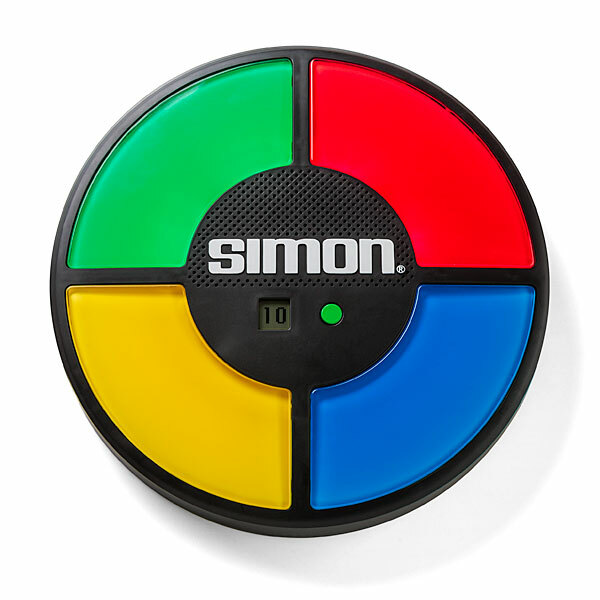 Do we get to play Simon?” And immediately I felt like an idiot, because that would have been way more awesome! This got me thinking about other games or puzzles that could be used in D&D. You could even use in-game skill checks (likely Intelligence, Dexterity, or Wisdom) to give advantages to the players. Here are a few examples of games that would work well, with the advantages players could earn. I could easily see Simon and Mastermind themed in-game as arcane locks or barriers. Crokinole or Sorry! Sliders might be a challenge from a particularly nimble NPC. Operation is more of a stretch, but you could use it to represent a dormant golem that must be reactivated or something similar. Card and dice games could be implemented in your sessions as well. I have a copy of Three Dragon Ante that is very thematic, though sadly the original with the traditional chromatic and metallic dragons is out of print. A simple dice game like Farkle would add a little bit of flavor to an encounter in a seedy tavern. A set of playing cards with fantasy themed art can get you lots of mileage as well. My players got a kick out of mixing a little Perfection into D&D, and it was very easy to theme it in such a way as to avoid immersion. The next time you are stuck thinking of a cool new thing to present to your players, take a look in your game closet, toy box, or the board game aisle at your local game shop or even big box store for inspiration. 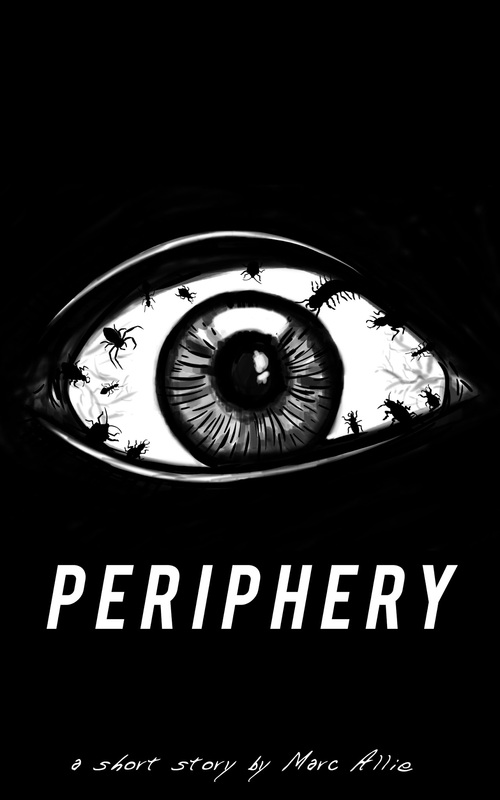 Have you read my book yet? Check it out, if you haven’t!